I met this awesome chick named Lucia who was rocking the best mani/pedi ever. 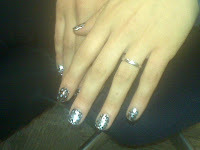 I was shocked when I caught a glimpse of her metallic leopard print fingertips! Then when she showed me that her toes were coated in silver metallic too. I had to ask questions. Minx are flexible polymers that are heated up by a 250 watt lamp and applied directly onto your nails (natural or tips) like stickers. They're presized, pressed, heated and rubbed on, then filed down with a glass file to fit the size and shape of your nail. The average cost is $50 per set and as long as you take care of them they can last longer than regular polish. (Beyonce's lasted about two weeks). I think they're perfect for a special occasion and can't wait to get them done. "Adding fun to your manicure should come first and foremost," commented Logan. In case you're not into leopard print like Lucia and I, they have multiple designs to choose from to fit every personality. Click here to find out where you can get Minxed by you. *If you're in the New York area and would like to get hooked up by manicurist to the stars, Miss Lisa Logan herself, comment below and I'll make it happen. What's Up with Men and Their Brows?